So it had been a very long time, weeks in fact, since I had baked any muffins. Instead I was busy creating and enjoying healthy, guilt-free snacks like Mango Lemon Bars and Buckwheat Lentil Crackers. 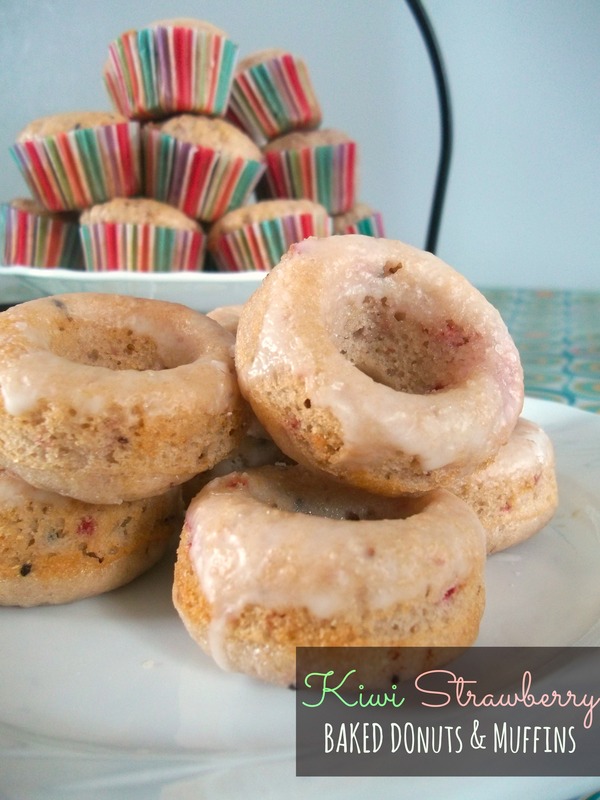 Then suddenly I spotted an enchanting strawberry-kiwi bread recipe from Cast Iron Canteen that allowed me to transform a very over-ripe kiwi and a handful of borderline strawberries into mini muffins and donuts. The idea to glaze them was mine, since my way-past-its-prime kiwi was not tart at all. The citrus glaze accented the fruit well and brightened the taste. 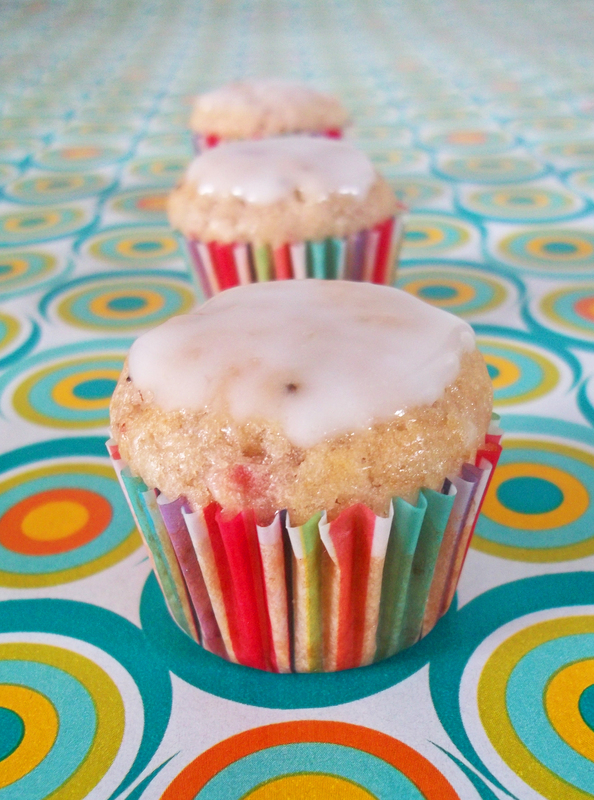 Even before I glazed the muffins, I could not stop and eat just one. Try them for yourself and you’ll never want to toss out an old kiwi fruit again! Mash kiwi and dice strawberries or chop the fruit in a blender or food processor. Stir in almond extract. Preheat oven to 350 degrees F (180 C). Use a teaspoon or fill a plastic bag with the corner snipped off to transfer the batter to mini-muffin liners or a greased mini-donut pan. Bake for 12 to 14 minutes or until baked through and edges are slightly golden. Allow donuts or muffins to cool. Whisk together lemon juice and icing sugar to make a thick glaze. Then add milk and stir until smooth, adding more icing sugar if needed. Dip donuts or muffins in the glaze. Serve after glaze has dried. Awesome recipe! Thanks for inspiring me to try it! Never thought of putting kiwi in a muffin, or donut for that matter! Looks delicious. I am a glaze fiend. Oh yes a double glaze dipper. I’d never thought of baking with kiwi either. I was so intrigued that I had to try it. And I’m very glad I did! Enjoy that glaze! I do think you’ll like them. Thanks! Kiwi and strawberries were made for each other! These look delectable and every bit as irresistible as you describe! I wouldn’t be able to keep my hands off them. I absolutely love this idea. I have never backed with a kiwi before but you can bet I am now! Thanks for sharing! Pinning! love it never would have thought to put kiwi in muffins/donuts will try youngest loves kiwi thanks for sharing pinned it. Thanks for pinning my recipe. 🙂 I think your daughter will enjoy them! Love this recipe! I’ve never actually baked with kiwi before, but I’m willing to give it a shot! Pinning! I’d be thrilled if you linked this up to my Creative Ways Link Party that’s live right now. Hope to see you there! Thanks, Nici! I’m off to check out your party! It will be great recipes for our summer holiday snacks. Kids cannot stop eating longer in the summer holiday. Thank you very much for sharing. These look so delicious and perfect for summer! I pinned and tweeted. Thanks for sharing your recipe and for stopping by ThriftyBelow.com!